NEW YORK May 2009 data from Nielsen Online show that people continue to spend more time on social networking and blog sites than ever before. Total minutes increased 82 percent year-over-year and the average time per person increased 67 percent year-over-year in May 2009. 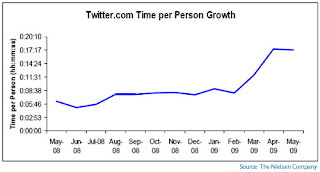 Twitter.com was the fastest-growing Web brand in May 2009, increasing 1,448 percent year over year, from 1.2 million unique visitors in May 2008 to 18.2 million in 2009. Despite being the fastest-growing brand year-over-year, Twitter's month-over-month growth has begun to slow, increasing 7 percent from April. • With 144.3 million unique visitors, Facebook was the No. 1 global social networking destination in May 2009, the seventh straight month that Facebook has ranked No. 1. • May 2009 also marked the fifth month in a row that Facebook has been the No. 1 social networking site in the U.S., garnering 75.4 million unique visitors -- a 190 percent increase over May 2008. • Myspace.com continued as the top social networking site when ranked by total video streams in May, with 116.1 million video streams. • Unique viewers of video content at Myspace.com increased 22.9 percent month-over-month, from 9.9 million in April 2009 to 12.2 million in May 2009. Download Nielsen's May 2009 data on social networks.